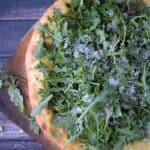 Greens Pizza is a healthier option to traditional pizza that is delicious enough to impress everyone in the family! Place baking stone in cold oven and heat to 550 degrees 1 hour before you are ready to cook your pizza. Place pizza dough on a sheet of parchment paper. Pat down and shape pizza dough into a circle, 12 to 13-inches in diameter. Lightly brush the top of pizza dough with olive oil. Slide parchment paper and pizza dough onto hot baking stone. Bake for 3 minutes until lightly golden brown. Remove from oven and spread with basil pesto. Top with arugula leaves, drizzle with olive oil, salt and pepper. Finish pizza with finely grated Parmesan cheese, slice and serve.